Share the post "Album review: BILLY JOEL – A Matter of Trust: The Bridge To Russia"
As I was passing through HMV this week – in awe of the growing racks of 180 gram vinyl (you’d need a course of body building supplements to walk out with Purple’s 9 LP Made In Japan box set) – I briefly browsed the bargain bins – momentarily picking up Billy Joel’s Greatest Hits Vol. 1 & 2 compilation – the third best-selling album in the US. A snip surely at less than the price of a pint? As I glanced down the impressive 26 track listing a couple of thoughts struck me – firstly that The Stranger (1977) was a damn fine album, and secondly that Billy Joel never moved on from the Eighties. I then put the CD carefully back on the rack, deciding my pennies would be more wisely invested in Wetherspoons. Subconsciously or not, I hadn’t realised Joel’s last ‘proper’ release was River Of Dreams (1993) and that he’s felt comfortable living off and performing his back catalogue ever since. So there was something of a sense of ‘karma’ when this 2CD/2DVD set arrived less than 24 hours later. Fans won’t need me to tell them that Billy’s second live album – Kohuept – released in 1987 at the height of his popularity – captured the Soviet Union leg of his The Bridge tour making history in being the first live rock radio broadcast in Soviet history. Re-released as a deluxe 2CD & DVD set, this expanded version now includes the live show in its entirety with 11 previously unreleased tracks, the concert footage has been restored from the original 35mm negative with an additional 12 previously unseen performances, and there’s a feature documentary chronicling the Soviet leg of the tour, one of the first by a major Western artist behind ‘the curtain’. And all for a reasonably modest outlay. With the documentary setting the scene and providing the cultural context this is in many ways the perfect purchase for fans and the curious alike. The venture was something of a personal crusade and victory for Joel, taking a large personal financial ‘hit’ to break down the barriers with his brand of rock ‘n’ roll. It captures him at the height of his powers and for those whose recollections are of the man as simply a singer/songwriter, his onstage energy – up there with Springsteen and Elton John – is something of a revelation. The performance is first rate, from the man and his band and, but for the old mullet and the fact Billy would have to been cryogenically frozen, could have been recorded in the last 12 months the sound and visual quality is that good. 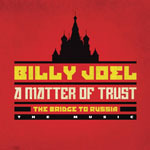 This entry was posted in ALBUM REVIEWS, ALBUM REVIEWS (Mobile), All Posts, Reissues and tagged A Matter Of Trust - The Bridge To Russia, album, Billy Joel, CD.DVD, concert, documentary, live, review, singer, songwriter. Bookmark the permalink.